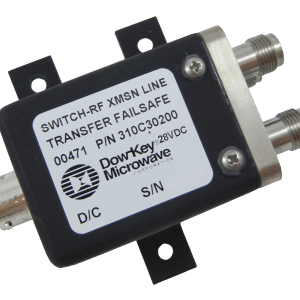 Dow-Key Microwave is a leading manufacturer of RF Switches , RF Switch and components. We offer an extensive line of electro-mechanical and solid-state, coaxial switches for a wide range of RF and microwave applications. We also have extensive experience in delivering high quality products for commercial, Military, Avionics and Space markets. Single pole single throw (SPST), single pole double throw (SPDT), double pole single throw (DPST), double pole double throw (DPDT), single pole four throw (SP4T), single pole eight throw (SP8T), single pole ten throw (SP10T), single pole twelve throw (SP12T) and single pole fourteen throw (SP14T). Pulse Latching with Suppression Diodes. Can’t Find the RF switch you’re looking for? Click Here For A Custom Quote.